Cigarettes, marijuana, alcohol and food cravings share a similar two part structure. They serve to suppress negative feelings like stress, anxiety, anger, boredom and loneliness - and they serve to bring in positive feelings like relaxation, confidence, love and happiness. But there are side effects and after a while the smoking has more problems than benefits - and because the smoking serves to suppress negative emotions you can't just take away the cigarettes because it will leave you feeling vulnerable, and then you find yourself smoking again. 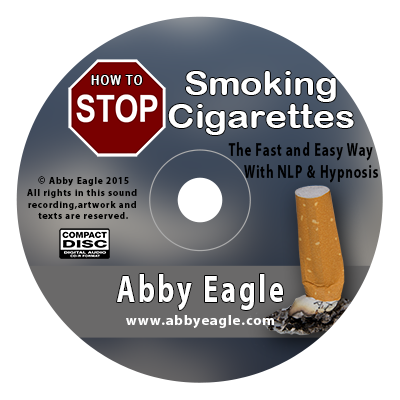 The answer to quitting cigarettes is to use NLP and self Hypnosis and give specific suggestions to the unconscious mind to banish the cigarettes and bring in feelings of confidence, love and happiness in its place. In this way giving up the cigarettes does not require will power and there are no withdrawal symptoms or feelings of loss. - Stop smoking without having to use willpower. "Hi Abby, first I wanna say thanks! I used your banish cigarettes a week ago and it worked perfectly." "Hi Abby, Still going strong! And I'm still a non cigarette smoker... Just over 3 weeks. I truly believe that these self hypnosis tapes work!... If you want them too!